Theories of the rentier state and the resource curse are amply discussed in the other papers in this collection and require no elaborate introduction. Here, we instead reconsider one central claim of that literature: that conditional on the availability of substantial resource rents, autocratic regimes are likely to be unusually long-lived, a quality usually described as durability or resilience. We echo and extend arguments made by Michael Herb (1999), Matthew Groh and Casey Rothschild (2012), and Justin Gengler (2015), each of whom finds that the countries of the Arabian Peninsula are empirically distinctive in ways that confound standard studies of the political and economic consequences of oil-based development. We provide a novel account of the distinctiveness of the Arabia Peninsula and the challenge the Peninsula’s polities pose to standard quantitative analysis. We then re-estimate the effects of oil on regime durability to show that the conventional wisdom is not robust to model specifications that adjust for the distinctives of the Arabian Peninsula. What make the politics of the peninsula distinctive? Many things, identified first by other scholars. Gengler (2015, 15) observes that the six GCC states of the Arab Gulf are outliers in two dimensions: their near-invariant low democracy scores and their fuel rents which, on a per capita basis, dwarf the average size of rents in the rest of the world. Consequently, looking at a simple bivariate, cross-sectional analysis of fuel rents per capita and a nation’s Polity IV score, the negative relationship is between oil and democracy “is almost entirely dictated by the small number of outlying observations consisting of the Arab Gulf states along with Brunei and Libya.” Herb (1999) argues persuasively that the monarchies of the Gulf states are “dynastic monarchies,” a distinctive type of monarchy whose internal structure has proven to be unusually resilient. Independent of any effects of oil, then, we have solid theoretical reasons to believe that the Gulf states will be resilient non-democracies. 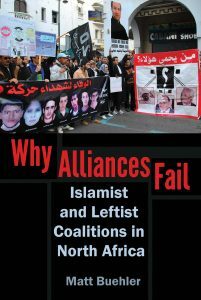 Our current research, summarized in this brief paper and available in greater detail in other papers, asks a question prior to the analysis of Herb, Gengler and others: Why do the Arab Gulf states exist as sovereign states given the enormous threats to their survival in the early part of the twentieth century? After all, small principalities were common in pre-modern history but tended to disappear in the post-colonial era. Compare a map of the Arabian Peninsula to a map of pre-independence India: the former contains five principalities – Kuwait, Bahrain, Qatar, the United Arab Emirates, and Oman – that survived from the era of quasi-independence during the long period of Pax Britannica, while the latter contains the former Princely States – hundreds of them! – that enjoyed British protection but simply disappeared at Indian independence. The phenomenon to which we are drawing attention is a type of sample selection bias called survivorship bias. Survivorship bias occurs when a social or political process causes many units to drop out of the sample, while those which survive and enter the sample exhibit peculiar features, consistent with their survival, that makes them non-representative of the larger population. Left uncorrected, survivorship bias can lead to biased conclusions. Therefore, standard practice is faulty. Standard practice is to estimate a conditional probability function, such as the probability of autocratic survival conditional on access to resource rents, on all units in a cross-sectional and longitudinal data set that spans the globe. Using all of the relevant data would seem to assure most scholars that they are not inducing bias through selecting a biased set of cases; but with survivorship bias, the bias is built directly into the data set. The claim that survivorship bias exists such that commonly used data sets “over-sample” units that have extremely high oil resources and also have inordinately resilient monarchies likely to survive even in the absence of oil, requires the appropriate causal model. Figure 1 below provides this model and conveys the critical points we wish to defend and whose implications we then explore. Figure 1 commits us to validating three causal relationships, each represented by a solid arrow in Figure 1. Conditional on establishing these claims, Figure 1 also licenses us to make some necessary adjustments to the data set in order to reconsider the relationship between oil and autocracy. Here, we briefly summarize the set of causal claims that are validated in longer versions of this paper. First, by the very end of the 19th century and the early part of the 20th century, British strategic interests in the Gulf were undergoing transformation. While the traditional interest in maintaining a secure link to India was never displaced, with the onset of the Age of Petroleum, the British Admiralty under Winston Churchill – later the Colonial Secretary in charge of the Middle East – became obsessed with the question of securing access to cheap oil. The British met this goal in part by adding new layers to existing arrangements with the rulers of Gulf principalities – Kuwait, Bahrain, Qatar, the original Trucial States that would become the United Arab Emirates, and Oman — between 1913 and the early 1920s. These new agreements obligated local rulers to award oil concessions to British firms in the event that oil fields were discovered in the future. These new treaty obligations further committed Britain to their continued independence, as the newly guaranteed monopolistic access to potential oil fields was only valuable as long as the signatories continued to rule. Second, the desire to control potential oil fields led the British, beginning in 1920, to defend the five principalities from repeated incursions triggered by the dynastic and territorial ambitions of Ibn Saud. We feel highly confident concluding that were it not for British protection and intervention, the Kingdom of Saudi Arabia would have expanded to the shores of the Arabian Gulf: contemporary observers, British and Arab, agreed. While it is possible that some of the principalities would have survived as city-states, their hinterlands where the oil was to be found would be within the borders of a Saudi super-state. Third, we argue that British intervention inadvertently transformed the five principalities in ways that made them inordinately durable monarchies; these transformations largely preceded the large-scale exploitation of oil. In particular, the dynastic stability that some attribute to either the special features of monarchies (Gandhi 2010), to the special political culture of Arabian monarchies cultivated over the centuries (Menaldo 2016), or to the specific dynastic institutions particular to Gulf monarchies (Herb 1999), was largely a product of relatively recent British intervention. Ironically, dating back to the mid-1800s, British policy-makers worried that their treaty protection of the principalities were engendering moral hazard; these worries were prophetic. Given the reality of endogenous borders, one implication is we think incontrovertible: that these five principalities would not exist as sovereign nation-states were it not for their oil, and that the process of maintaining their independence contributed greatly to their autocratic resilience. Global data sets, then, are not a random sample of all potential data sets; they are a biased sample that over-represents small, resource-dependent countries that are highly likely to be anomalous autocracies. How should we correct this problem? We have no choice but to begin the analysis with a standard global data set, but we feel justified in making some adjustments to it based on the counterfactual we have justified: without British intervention, the entirety of the eastern littoral would fly the Saudi flag. Using the existing data set, we first test a run-of-the-mill hypothesis: following the standard story of the political resource curse (Ross 2012, Geddes et al 2015) we posit a negative or deterrent effect of oil and gas revenues on the probability of authoritarian breakdown. The second hypothesis embodies our correction to the problem of survivorship bias. It constructs a counterfactual historical landscape in which all the other Gulf states have been annexed into Saudi Arabia, and thus tests whether their existence as independent states affects the impact of oil/gas revenues on authoritarian breakdown. Here, the oil revenues of the “annexed” five countries are incorporated into the oil income of Saudi Arabia. Kuwait, Bahrain, Qatar, the UAE, and Oman are dropped from the data set, and all of their oil revenues are assigned to the counterfactual super-Saudi state. We test these two hypotheses, one referring to the imperfect world we happen to inhabit and one to the “corrected world” in which survivorship bias has been removed, by estimating first logit and then Cox semi-parametric hazard models. Each of these models contains the standard suite of control variables. The results are stark: while the rentier state hypothesis performs as advertised in the uncorrected data sets, the effect disappears in the counterfactually corrected data sets. Model coefficients are sharply reduced in size and they lose statistical significance. Without the five independent principalities, there simply is no rentier effect on autocratic stability. These results are robust to almost two dozen different model specifications. We conclude with two comments. First, we recognize that some of the claims we are making are controversial. Much scholarship, beginning with Monroe’s (1981) classic history of Britain’s “moment” in the Middle East, denies that Britain was motivated by the need to gain access to oil resources. Herb’s (1999, 29-30) exhaustive account of dynastic monarchies in the Gulf denies that the British played a significant role in the construction of dynastic monarchies. We take the claims very seriously, but we believe that substantial empirical evidence, far too lengthy to summarize here, justifies our claims. Second, we are making a relatively narrow empirical claim about survivorship bias among the five Gulf principalities. We recognize that endogenous borders are quite common; we also recognize that borders in the Middle East have frequently been contested. Some principalities with oil and British sponsorship disappeared, after all. Therefore, it is crucial to emphasize that our claim of survivorship bias rests on the causal model depicted in Figure 1 above. 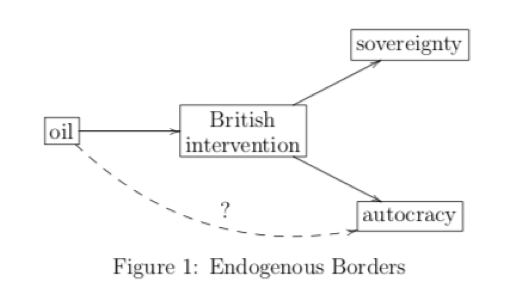 Parallel claims about endogenous or contested borders must be similarly justified before adjustments such as the ones we make here will be methodologically valid. Still, while methodologically cautious, we encourage others to follow the methodological guidelines we propose here. We study political and economic outcomes by analyzing data, much of which has been generated by those same political and economic processes. We need to take the idea of a “data generating process” more seriously, taking the term literally to mean the creation of data, first and foremost by generating units for which attributes can be predicates. We suspect that as this practice becomes more widespread, other scholars will give us reasons to rethink some other conventional wisdoms. Herb, Michael 1999. All in the Family: Absolutism, Revolution and Democracy in the Middle Eastern Monarchies. State University of New York Press. Gandhi, Jennifer. 2010. Political Institutions under Dictatorship. Cambridge University Press. Geddes, Barbara, Joseph Wright, and Erica Frantz. 2015. Oil and Autocratic Regime Survival. British Journal of Political Science. 45 (April): 287-306. Gengler, Justin. 2015. Group Conflict and Political Mobilization in Bahrain and the Arab Gulf: Rethinking the Rentier State. Indiana University Press. Groh, Matthew, and Casey Rothschild. 2012. Oil, Islam, Women, and Geography: A Comment on Ross (2008). Quartely Journal of Political Science 7:69-87. Menaldo, Victor. 2015. The Institutions Curse: Natural Resources, Politics, and Development. Cambridge University Press. Monroe, Elizabeth. 1981. Britain’s Moment in the Middle East, 1914-1971. The Johns Hopkins University Press. Ross, Michael. 2012. The Oil Curse: How Petroleum Wealth Shapes the Development of Nations. Princeton University Press. Authors share equally in all work on this paper. We thank the participants of the Politics of Oil and the Changing Rentier State workshop, George Washington University, September 29, 2018. This draft of our memo benefitted especially from comments by Justin Gengler, Michael Herb, Steffan Hertog, and Marc Lynch. We thank Steffan Hertog for bringing this point to our attention.